New Delhi - Tata Steel's decision to sell its long product business in the UK and its bank debt refinance plan will be credit positive and alleviate funding pressure, Moody's Investors Service said on Monday. "The sale would be credit positive for Tata Steel UK Holdings (TSUKH) because it would dispose off loss-making assets, while its refinancing alleviates funding pressure for the next six years," the financial research firm said in its Credit outlook for the company. "Moreover, having sorted most of TSUKH's challenges, Tata Steel, its parent, can now solely focus on growing its more profitable Indian business," it added. London, Oct 16 : A report has revealed that Tata Steel is planning to sell its Long Products Division that employs 6,500 people in the United Kingdom and Europe and includes operations in Scunthorpe and Teesside in England, and Dalzell and Clydebridge in Scotland. Jamshedpur: Pitching for proper utilisation of resources, Tata Steel MD (India and South East Asia) T V Narendran today said it is "unfortunate" that steel and iron ore are being imported by a country blessed with rich mineral reserves. "It is really unfortunate that we are importing steel and iron-ore whereas we have abundance of the mineral in the country," Narendran said. 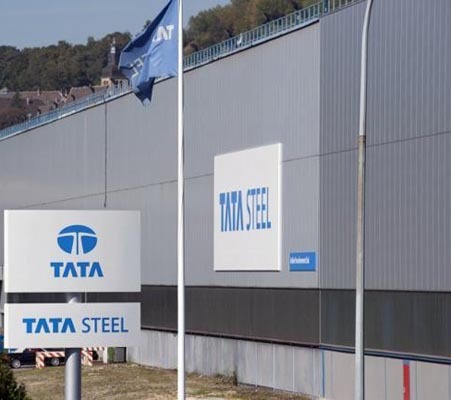 New Delhi: Global steel giant Tata Steel's consolidated net profit plunged by 70.38 percent to Rs 337.33 crore in the April-June quarter, mainly due to Rs 1,577 crore write-down in a project. Tata Steel group had reported a net profit of Rs 1,139.01 crore during the corresponding quarter in 2013-14 . Net profit for the quarter came in at Rs 337 crores, affected by exceptional charges despite improved operating performances across all geographies, the company said in a statement. London: Tata Steel is to cut an estimated 400 jobs at its plant in the UK as part of the company's restructuring process and to increase competitiveness amid sluggish demand. Chief executive Karl Koehler said the changes at the Port Talbot plant in Wales were vital if Tata Steel, the world's 12th largest steelmaker, was to remain competitive. The proposed changes are aimed at enabling the UK Strip Products business to compete in Europe's lower market demand era by reducing costs. Mumbai, Aug. Aug 8 : Tata Steel will fabricate 60,000 tonnes of high-quality rails for a new high-speed line linking the Muslim holy cities of Makka and Madina in Saudi Arabia, a company official said here Thursday. The new line, being constructed since 2009 and expected to be operational late next year, will ferry millions of pilgrims on the 444-km journey between the two cities at speeds of 320 km per hour. Indian steel producer Tata Steel has reportedly plans to acquire British steel giant Stemcor's iron ore mine in Orissa - a state situated on the east coast of the country. Stemcor has defaulted on more than $1 billion of loans as global slowdown in the steel industry has hit its business hard. The British firm is thus trying to sell some of its assets to get rid of some burden of its loans. The reported sale of its iron ore mine in Orissa is expected to fetch it nearly $800 million. Kolkata, July 10 : Tata Steel Wednesday said the company registered 26.49 percent increase in sales to 2.005 million tonnes in the quarter ended June 30, 2013, from 1.585 million tonnes during the corresponding period a year ago. The Tata Group's flagship company produced 2.145 MT of saleable steel during the first quarter of this fiscal, up by 23.27 percent compared to the like period of previous fiscal. During the period under review, the firm's hot metal production stood at 2.464 MT, while crude steel production stood at 2.223 MT, Tata Steel said in a filing to BSE. Tata Steel shares slipped nearly 2.3 per cent in early trade on Tuesday on account of the company's announcement that it was taking an impairment charge of $1.6 billion. The steel giant announced on Monday that it was taking a $1.6 billion (nearly Rs 8,000 crore) hit on its profit for financial year 2013. The company is all set to announce results for the past financial year on 23rd of May. Tata Steel blamed its beleaguered European operations for the huge impairment charge. Indian steel major, Tata Steel has said that it expects the steel prices in the country to largely remain stable in the current financial year. Managing director H M Nerurkar said that he expects the steel prices to remain stable and not fluctuate during the current financial year. He did not announce the reason for expecting the prices to remain stable this year even as he expects a 6-8 per cent growth in demand during the year. Currently, the average price of hot rolled coil is between Rs. 36,000 and Rs. 38,00 per tonne. Steel prices will likely remain under pressure during the first three month of current financial year, unless prices of key raw material iron ore drops, Tata Steel Ltd MD Hemant Nerurkar said. While slowdown in the economy brought demand for steel in automobile & construction sector, ban on extracting iron ore in Karnataka led to scarcity of the raw material, putting steel makers under intensified pricing pressure. Tata Steel has confirmed that it has acquired a majority stake in Canada's Labrador Iron Mines Holdings' iron ore resources for C$30 million (nearly Rs 163cr). As per terms of the strategic deal, Labrador Iron Mines Holdings will transfer 51 per cent stake in its Howse deposit to the Canadian minerals arm of Tata Steel, called Tata Steel Minerals Canada. In turn, Tata Steel Minerals Canada will transfer its Timmins 4 deposit to Labrador for C$3 million, which will be recoverable from sales. Tata Steel's 4.5 million euro investment in heat-retention boxes at its IJmuiden plant in the Netherlands is expected drag costs considerably down by save an estimated of 10 million cubic metres of gas per year. Ten million cubic metres of gas is sufficient to power as many as 5,500 homes. The newly installed heat-retention boxes will slash the amount of heat that slabs lose between the casting stage and rolling stage of the process of production. Tata Steel authorities have hinted that vested interests among workers led to workers-security guards clash leaving nine persons injured, but also admitted that firing on workers was a wrong decision. A verbal spar between Tata Steel contract workers and the company's security guards over taking bicycles inside company premises led to violent stone vs. bullet combat. Tata Steel Europe has announced its plans to close 12 facilities and axe 900 jobs across its UK operations, as part of its restructuring programme that aims to cut costs and enhance competitiveness. The steel giant will cut a total of 580 jobs in South Wales, while Yorkshire, the West Midlands and Teesside will witness 155, 120 and 30 jobs being slashed respectively. The company will also slash its Rotherham and Hartlepool operations due to the low demand for steel bars and pipes. Cross Keys and Tafarnaubach in South Wales are among the twelve sites that will be closed altogether. The combination of lower prices of steel, higher costs of raw material and poor demand made Tata Steel to report a consolidated loss of Rs 363.93 crore for the three months through September 30, against a net profit of Rs 212.43 crore in the corresponding period previous fiscal. Consolidated net sales jumped from Rs 32,507 crore to Rs 33,867 crore year-on-year; while earnings before interest, tax, depreciation & amortization (EBITDA) slipped from Rs 3,021 to Rs 2,452 crore. EBITDA margins stood at 7.2 per cent. Emerging reports suggest that the Odisha government has served notices to more than one hundred iron ore mining lease holders, asking them to pay Rs. 67,900 crore for their alleged involvement in illegal and excessive mining. An official in the Odisha government's steel & mines ministry revealed that a total of 103 iron ore mining companies, including Tata Steel Ltd and Essel Mining & Industries Ltd, had been served notices for violating statutory clearances and mining excess ore.